This morning, I woke to find that Chair has bumped Infinity Blade II to version 1.1. Whoo-hoo!! NEW CONTENT PACK! Infinity Blade II: ClashMob™! Jump into the all-new, globally social battle mode: ClashMob, featuring dynamic challenges that will test your strategic mettle. Recruit friends and team up together in MyMob and earn special perks as well as unlock new achievements & rewards! Upgrade your weapons by crafting the most powerful gems available in the all-new Gem Forge. More than two dozen new weapons, magic rings, gems and equipment to collect, wield and master. Fully supporting iOS 5.1, with gameplay enhancements and updates for overall optimized gameplay. All for free! 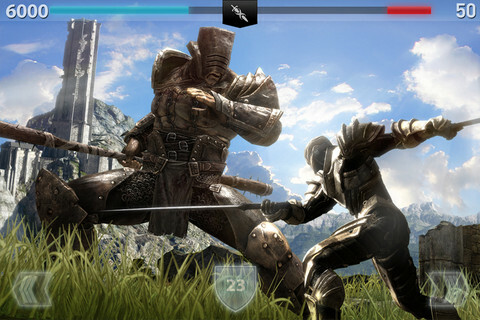 Infinity Blade II is now better than ever! For a limited time, you an buy Infinity Blade II for $4.99 from the App Store. If you have perviously purchased Infinity Blade II, the update, as always, is free. Infinity Blade II is compatible with iPhone 3GS, iPhone 4, iPhone 4S, iPod touch (3rd generation), iPod touch (4th generation) and iPad.Requires iOS 4.0 or later.